I have written this post so many times. I have deleted this post just as many times. For some reason, I am really struggling to find my voice today. Remember this face. She’ll make another appearance tomorrow. (That’s me on the . The one outside of the shark. 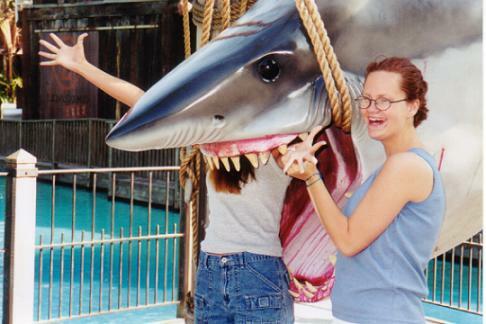 My friend Rachel is inside the shark and clearly I am saving her life.) Don’t you love my hair? And glasses? I do. Today is the 40th anniversary of the Roe v. Wade decision. As you know from many of my previous posts, I am a former pro-choice woman who now advocates for the unborn. This is a hard time of year for me for many reasons (as you will see with my post tomorrow), but one of the hardest parts is because I have lived both sides of the issue. I have blogged for choice and for a long time, as God began working in my heart, I felt like I’d lost my voice. I felt silenced. I felt like I fit in on neither side of the issue. I couldn’t call myself pro-choice anymore, but I also could not call myself pro-life yet. That middle place is a terrible place to be. Never before have a I felt so alone, so utterly alone and silenced. It is very difficult to lose that voice and find yourself on the other side of the issue. I don’t even think I can fully explain now what I felt then, as I was waiting for that season to end. It was almost more painful than the lie I was living, because at least when I lived the lie, I believed in what I was living. I realize as I look at this day with sadness that fills my heart that this very statement is how I want to advocate for the unborn — and just as importantly, for the mamas who are carrying those babies. You won’t see me protesting outside of Planned Parenthood. You won’t find me holding up signs of aborted babies. You won’t see me name calling or shame women who are considering or who have considered abortion in past or who have made the choice to have one or ten abortions, or any number in between. I just want to love those girls. I want to love those mamas whose lives are just as altered as the lives of their babies. I want my rhetoric to be fair and true and I want to become a safe place for those women (and men, if it may be) who might be dwelling in that middle place. I want to be someone the middle dwellers can trust as God reveals to them what He revealed to me, that He grieves for the 55 million babies never born. I want to know the facts and speak the truth in love and the way Jesus would. If you have stumbled across the blog and for whatever reason you are considering abortion, or you have had one, please know this: I love you and Jesus loves you. Your child had weight and has worth and you, too, deserve the right to grieve. And if you’re considering abortion, if I could share just one thing with you: it is hard now but not nearly as hard as it will be someday down the road if you look back and you look back on abortion. Please, please choose life.